Modele 300 S otrzymały hamulce tarczowe. 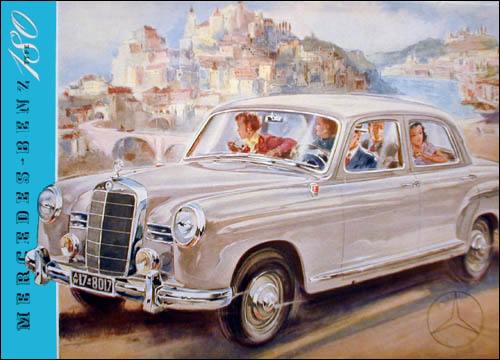 16 - 27 January: The Mercedes-Benz 180 D (W 120) with the 170 S-D diesel engine makes its debut at the Brussels Motor Show (pre-production from October 1953). 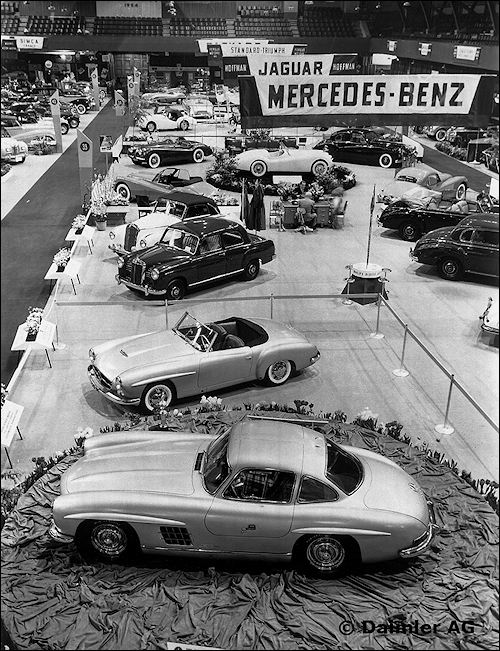 February 6 - 14: The 190 SL and 300 SL sports car models are presented at the International Motor Sports Show in New York. 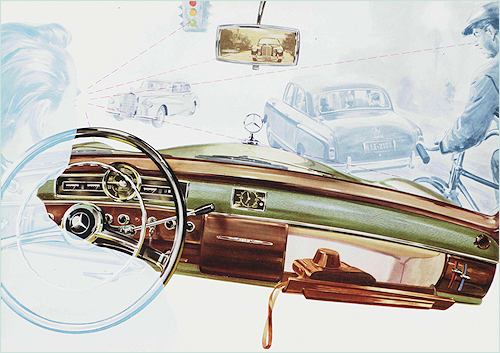 The 215 hp 3 liter engine featured in the 300 SL is fitted with a Bosch fuel injection system - the first time the petrol injection system has been used in a production vehicle with a four-stroke engine. 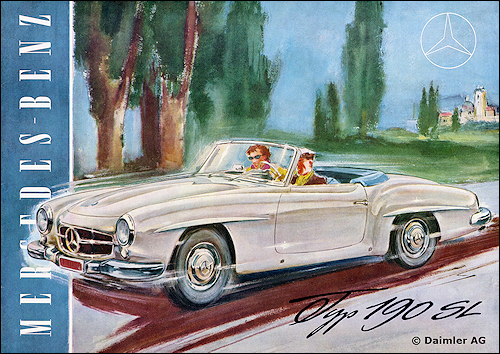 The 190 SL (W 121), created at the instigation of the then US importer Maxi Hoffman was shown as a prototype. 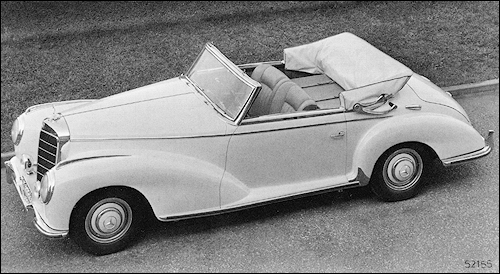 The very appealing drawn two-seater is derived from the 180. February: Price-reductions are introduced for the 170 S-V, 170 S-D and 180. The 180 now costs DM 9,450 compared with the previous price of DM 9,950. 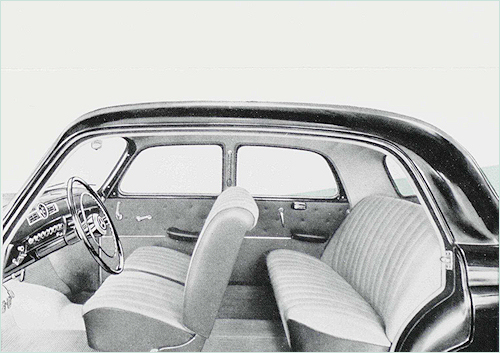 March: The launch of the new 6-cylinder model 220a (W 180) at the Geneva Motor Show marks the introduction of the single-joint swing axle in passenger car construction. 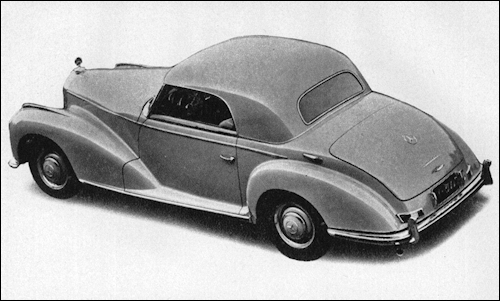 The engine came from the preceding type 220, chassis and body derived from the 180 with longer wheelbase. Production ran from June. 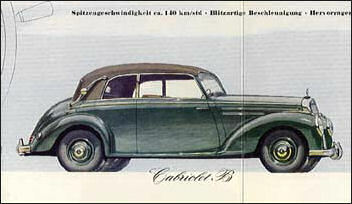 March: Production of the type 300b (W 188 III) with higher performance and larger brakes. March: The Indian company "Tata Engineering and Locomotive Comp., Ltd." (Telco) and Daimler-Benz AG sign an agreement covering cooperation in sales and the building of an assembly plant in Jamshedpur (India). 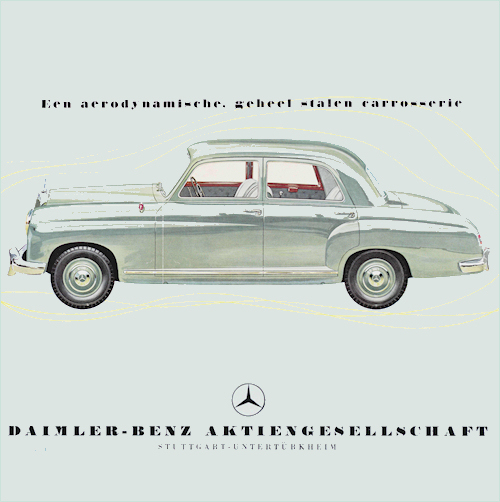 Daimler-Benz AG acquires a share of approx. 12.5% in Telco. 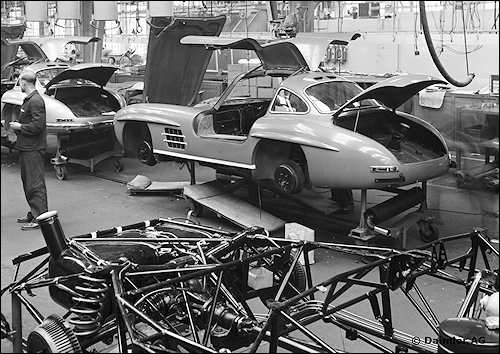 August: Series production of the 300 SL (W 198) sports car with fuel injection engine and top-opening gullwing doors begins. 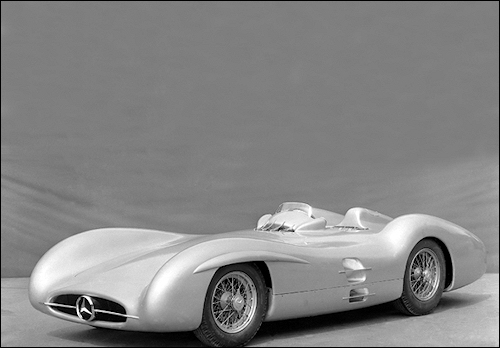 The racing prototype, presented in the spring of 1952, has been very successfully since then in various racings like Mille Miglia, Carrera Mexicana and other major events. 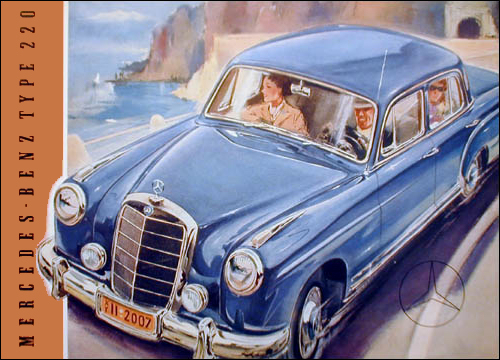 The Model 180 Mercedes-Benz is, to date, the latest product of a proud firm of long lineage and world-renown for quality, durability and performance. 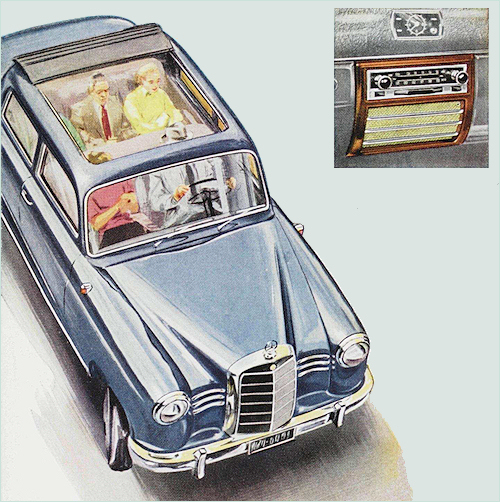 The new car, while conservatively styled to retain much of the dignified elegance of its forbears, yet contrives to make a direct appeal to the medium-priced US market. 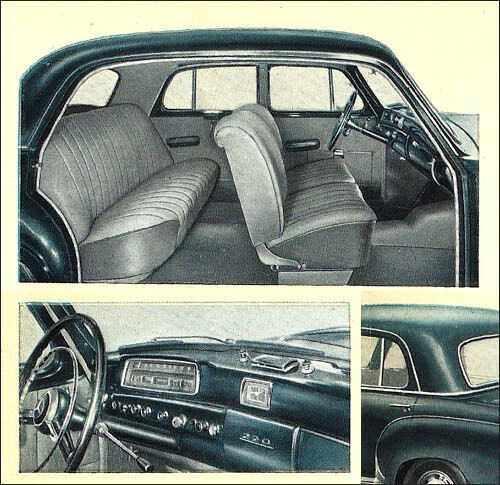 The radiator shell actually is a dummy which hinges up with the hood to allow easy access to the engine. 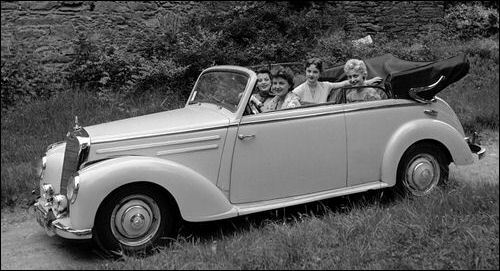 The four-cylinder, L-head power unit is claimed to be the most scientifically balanced unit of its type in the world and idles so smoothly at low speeds that it is often mistaken for a six. Meticulous workmanship and expensive detail finish impart a feeling of luxury to the compact sedan body which yet seats six in comfort. 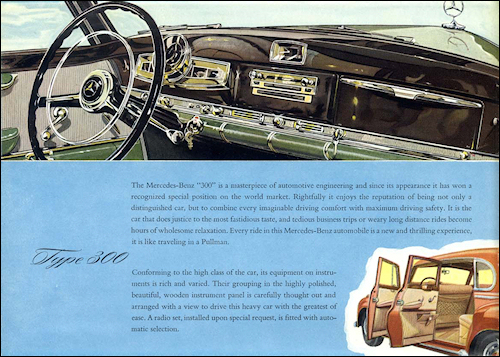 The Model 180's roadability is remarkable, owing in part to the independent suspension (by coils) on all four wheels, and to the swing-type rear axle. Top speed is not startling by American standards, but this car can be cruised indefinitely at very near maximum and offers excellent gas mileage with remarkable driving ease. 220 (R6 cyl, 2195 ccm, 80 PS) - end of prod. 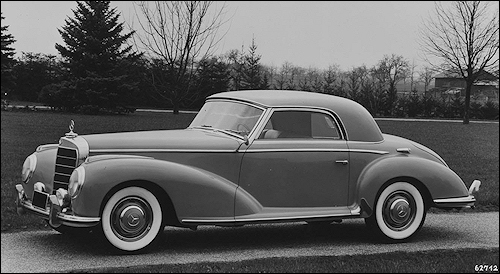 Faster The 6-cylinder high-powered engine of the "300" has an immense elasticity and runs almost noiseless, achievements which were attained by the engine's 6000 r. p. m. in conjunction with two new compound carburetors. By these features and an increased compression ratio of 7.5 :1 the output of the engine has been raised, which augments the torque especially in the lower and medium speed ranges. 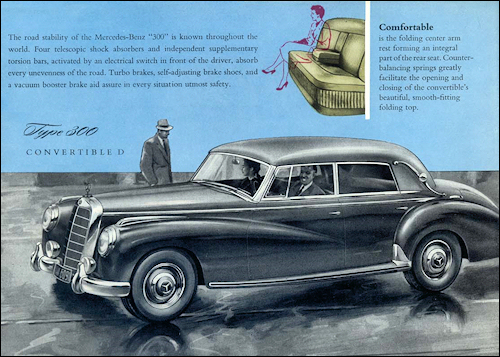 By stepping up the maximum speed to 100 miles (160 km), acceleration and climbing ability of the Mercedes-Benz "300" could be considerably improved. More economical Not only technical improvements but also a higher economy by a more rational mixing process of the two compound carburetors are offered by the new "300" engine. While at lower output requirements and at slower engine speed fundamentally only one stage of the carburetor is in operation, higher power consumption automatically sets its second stage working. 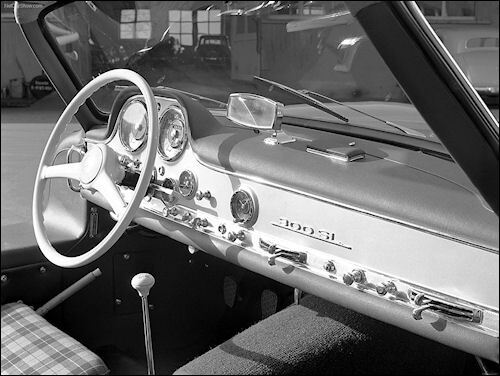 An automatic device renders the hand throttle superfluous. 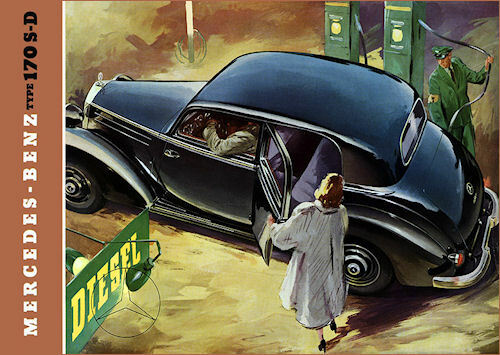 Safer The increased engine output entails also an increased driving safety. 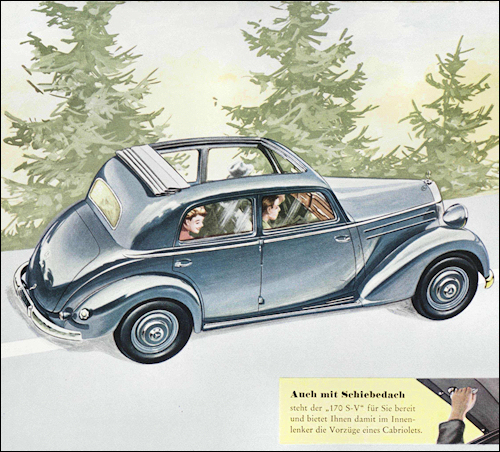 The effect of the turbo-cooled hydraulic brakes was rendered still more efficient by an additional vacuum booster. 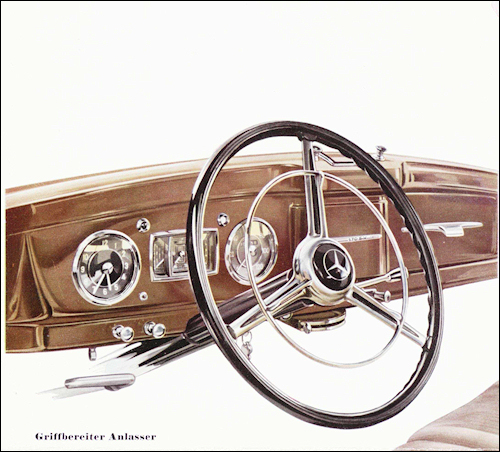 The brake system, taken over from the racing sports car "300SL", guarantees by its large-size light metal perlite-cast brake drums, even in cases of excessive and prolonged braking, smooth operation, instant action, and thus maximum safety. 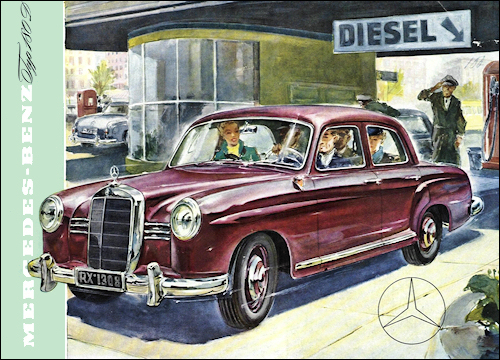 Raised to 136 HP, the 6 cylinder engine gives the "300" not only a lightning-bolt getaway and an exceptional acceleration for quicker and thus safer passing on the highway, but permits also to zoom along at 100 m/h in safety and comfort; technical marvels, that will awake in you the impression of performance at its very best. The comfortable and spacious interior offers ample accommodations for six people and even traveling at high cruising speeds on lang	cross-country trips, you will not be overcome by fatigue but enjoy the riding and the ride. 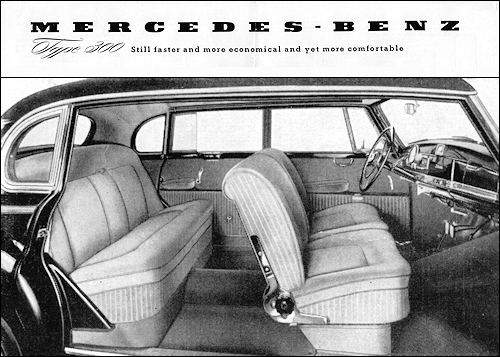 As a matter of fact, the "300" complies with even the most exacting requests for convenience and luxury: two single reclining seats in the front or a bench-type seat instead, that is adjustable to suit best your wish for the most comfortable leg space - softly cushioned rear seats with a hinged wide center arm rest - rails above the right and left rear windows with sliding cloth hooks - two interior lights an instrument panel made of beautifully polished wood with control lights and dials in direct line of the driver's vision - one large glove compartment which lights up automatically when opened, its lid may serve as a small table - a non-glare rear-view mirror - a luminous cigar lighter and knobs for ventilation and heating - revolving air vents on the front doors - two sun vizors of which the one at the right has a mirror in the back - two windshield wipers wich overlapping ranges three ashtrays, one an the instrument board and two in the rear. 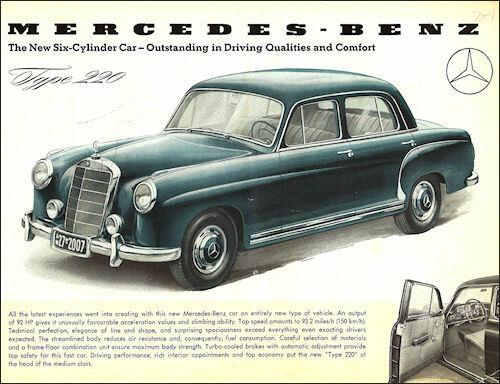 It was 1883 when the immortal Gottlieb Daimler built his first four-cylinder internal combustion engine; 1885 by the time his first automobile was running. 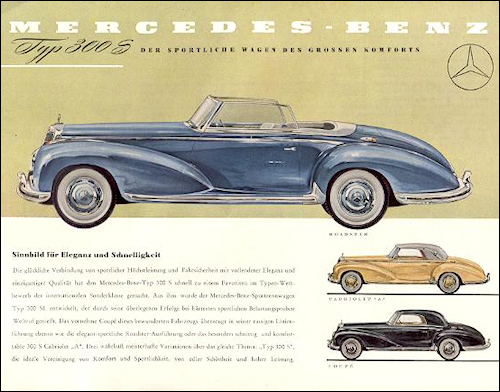 The amazing speed record of 142 mph set up in 1911 by Daimler's "Blitzen Benz" was another automotive landmark; but in honor of Mercedes Jellinek, daughter of the man who gave him financial backing, Gottlieb Daimler henceforth named his cars Mercedes. 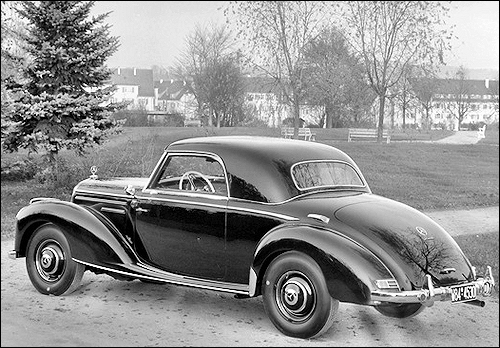 The Benz was continued for a time, however, and in World War I the German General Staff used Benz cars, as did the few motorized units. 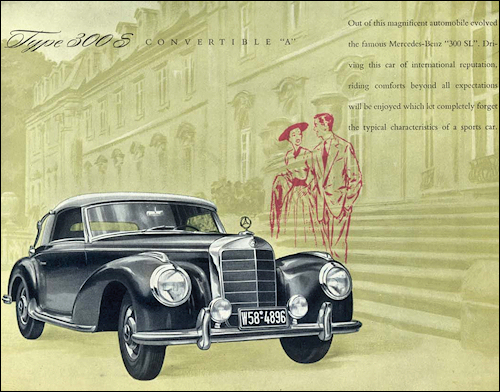 In racing, the name Mercedes became legendary through a succession of models and victories which culminated in the fabulous three-litre, supercharged model 163—a Grand Prix world conqueror along with Auto Union until World War II. 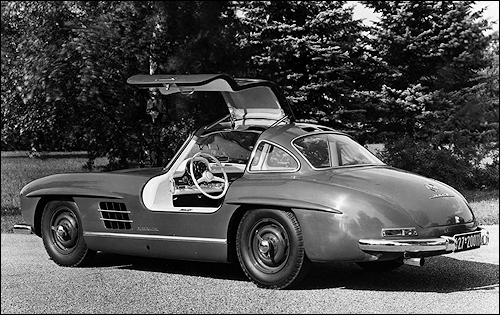 By 1952 Mercedes was ready once again to challenge all comers and promptly re-established itself by scooping both the Le Mans 24-Hour and Mexican road races with a sensational new 300 SL model—a three litre six-cylinder car of 190 bhp output. 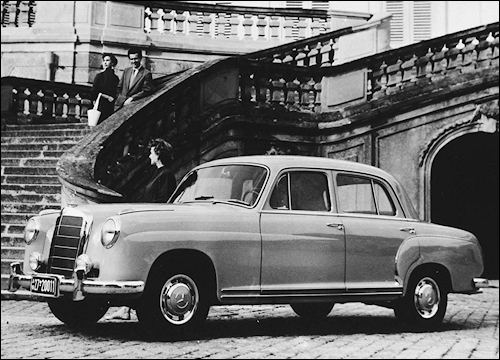 The luxurious and superbly engineered 300S Series is only one in a wide range of models which today once again stamp Mercedes as a leader. 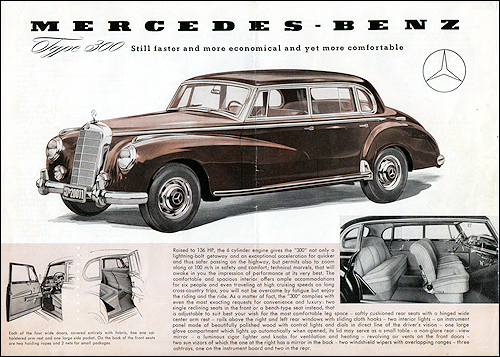 During 1954, a new two-litre, overhead camshaft sports Mercedes slanted at the US market is due to make its debut. Quoted is a highly competitive $3000 price. 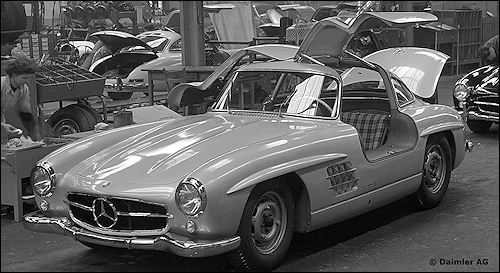 Series production of the 300 SL (W 198) sports car with fuel injection engine, presented in February began in August at Sindelfingen. 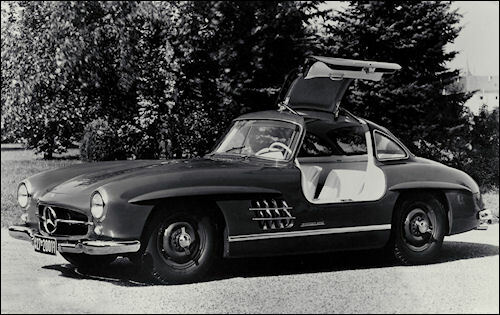 The characteristic upswinging doors of the high-performance sports car result in it being popularly referred to as the "Gullwing". 22 W 196 M196 2.5 L8 Hans Herrmann fail. 20 W 196 M196 2.5 L8 Hans Herrmann fail. 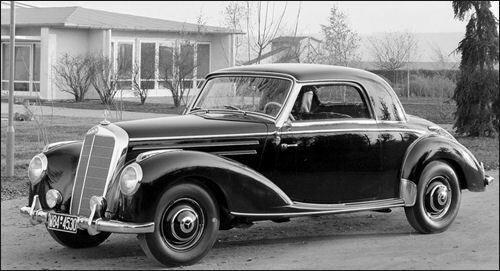 8 W 196 M196 2.5 L8 Karl Kling fail. 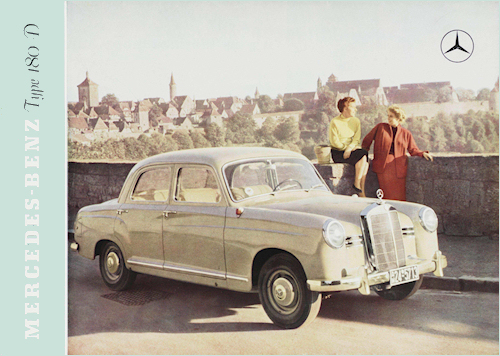 14 W 196 M196 2.5 L8 Karl Kling acc. 6 W 196 M196 2.5 L8 Hans Herrmann fail. 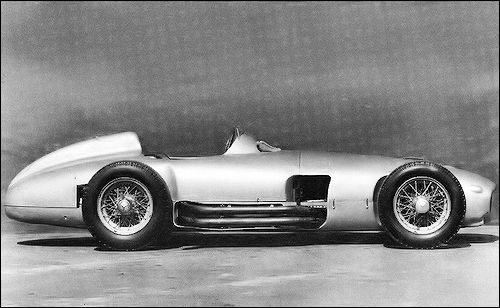 February: The new 2.5 liter W 196 Formula 1 racing car is completed. 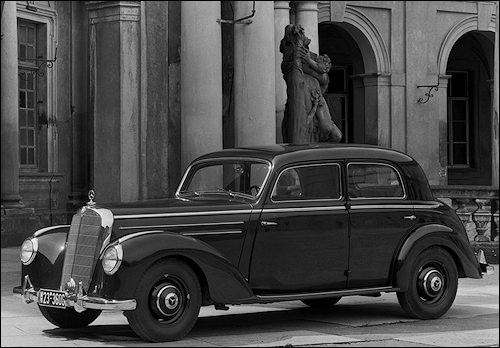 The new Daimler-Benz racing team consists of Juan Manuel Fangio, Karl Kling, Hans Herrmann and Hermann Lang. 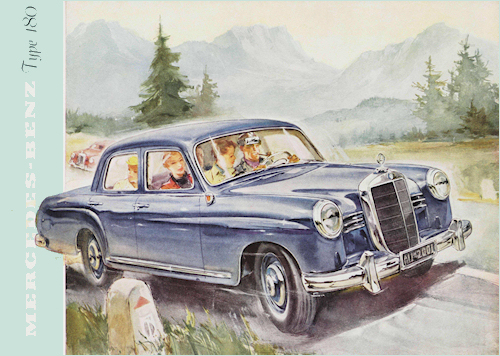 July 4: Start of Daimler-Benz AG's involvement in Formula 1 racing. 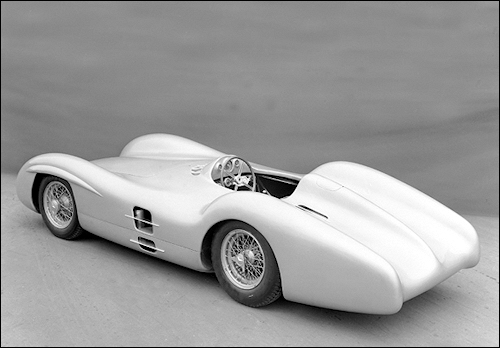 In its first competition, the French Grand Prix in Reims, the new W 196 streamlined racing car fills the top two positions. 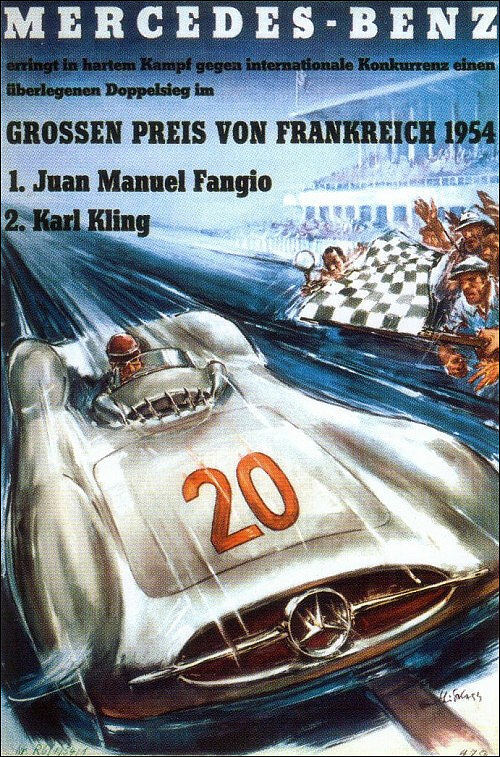 Juan Manuel Fangio takes the checkered flag, followed by Karl Kling in second place. 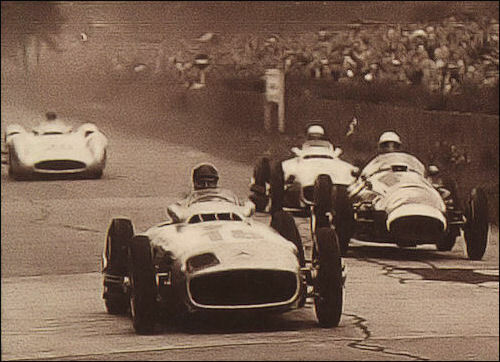 17 July: Fangio finishing fourth in the British Grand Prix in Silverstone. 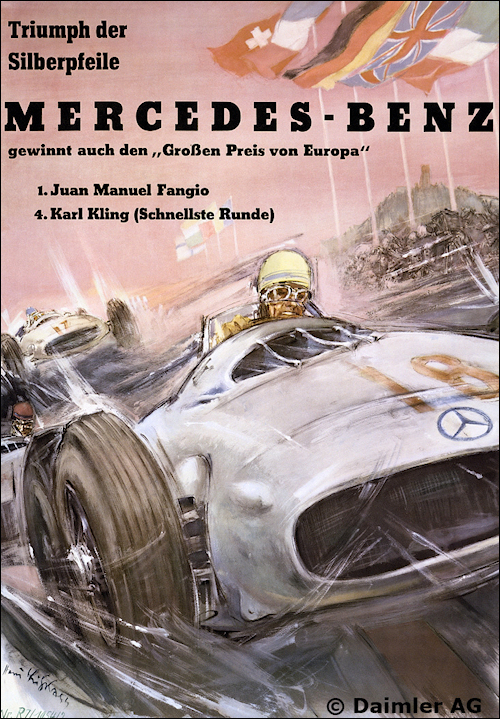 1 August: Juan Manuel Fangio wins the German Grand Prix at the Nürburgring. 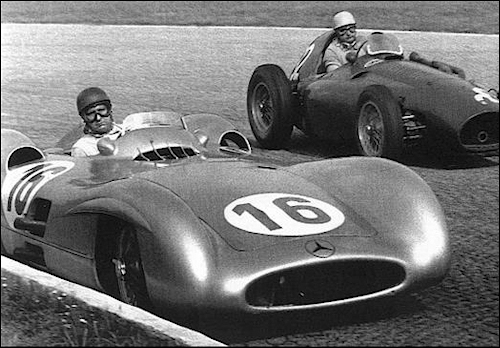 5 September: Fangio wins the Italian Grand Prix in Monza. He can already celebrate winning the Formula One World Championship crown by a huge margin after the penultimate race of the season. 24 October: In the final race of the Formula One season, the Spanish Grand Prix in Pedralbes, Juan Manuel Fangio finishes in third place. 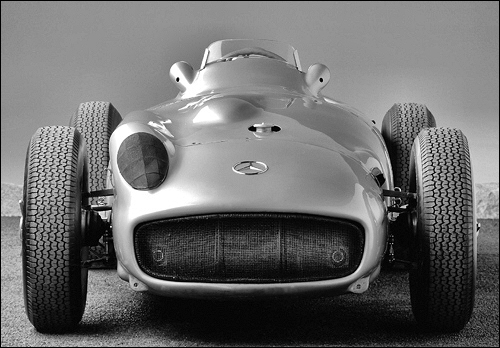 Four wins in six races, plus two more wins in a Maserati, are the outcome of his first season with Mercedes-Benz. 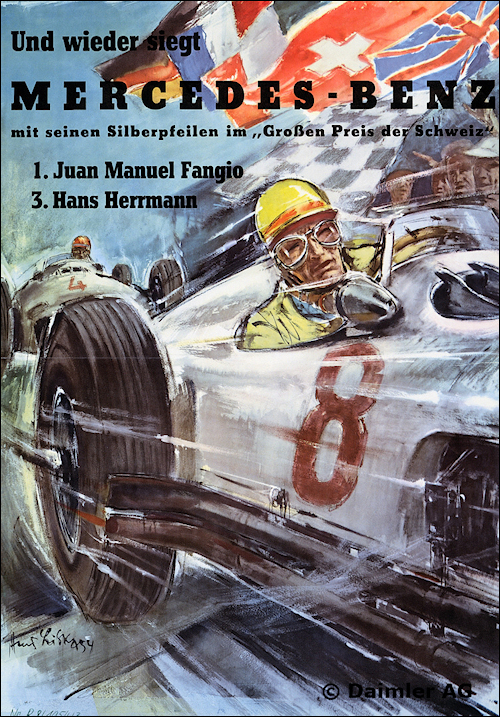 Juan Manuel Fangio becomes Formula 1 World Champion. 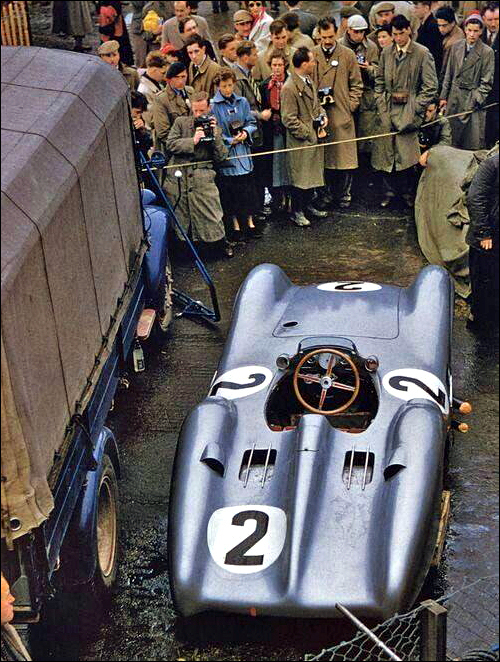 December: Stirling Moss signs a contract with Daimler-Benz AG for the 1955 racing season. 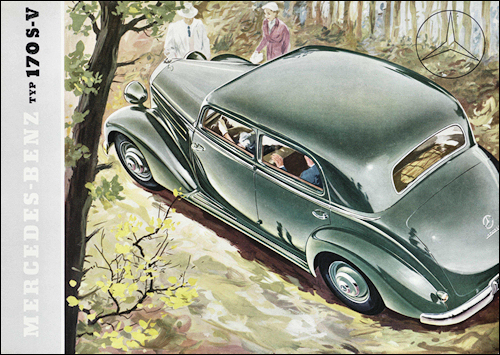 Debut of the W 196: J.M. 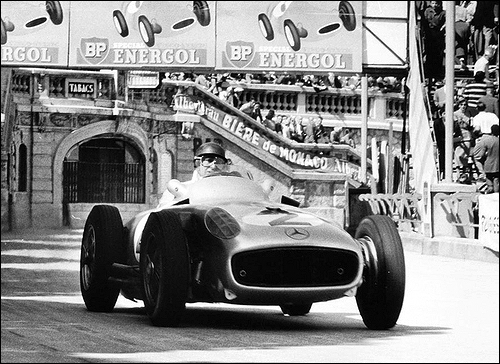 Fangio at French GP. Juan Manuel Fangio at Italian GP. 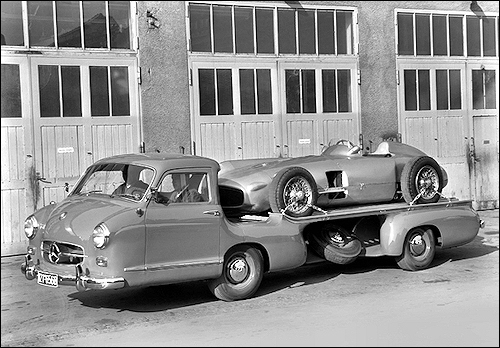 Karl Kling's Mercedes-Benz W196 just arrived for the British GP at Silverstone. W 196 Stormline wystawiony do wyścigu w Monza. 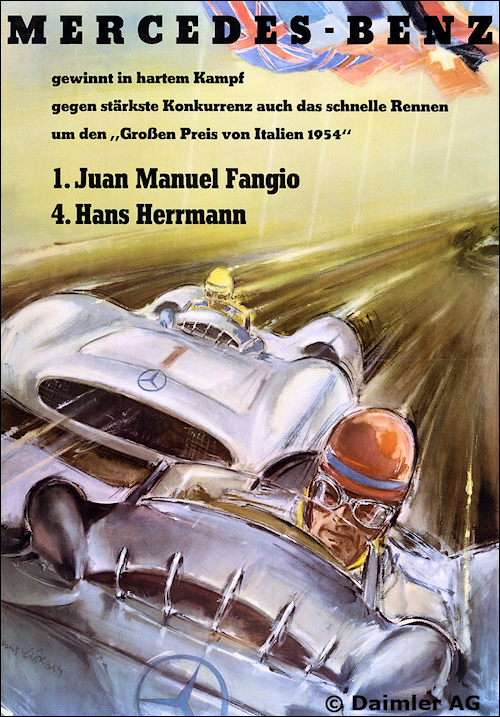 Juan Manuel Fangio jedzie po zwycięstwo w GP Niemiec na torze Nürburgring. Mercedesy na starcie wyścigu o GP Francji w Reims. 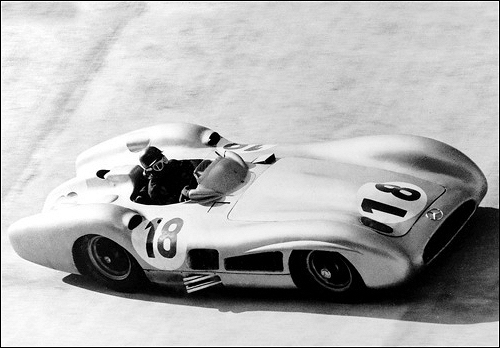 Z numerem 18 Juan Manuel Fangio, z 20 Karl Kling.